How to warn young children of the dangers of the World Wide Web and the Internet? Pushing buttons is such fun - and there are all those bright shiny objects just a click away. Jeanne Willis and Tony Ross turn their attention to this problem in this humorous cautionary tale. Chick creeps into the farmer's house one night - and finds his laptop. Soon the farmyard animals are benefiting (hilariously) from her activities. But chick is left alone - she bought the hens a boat and they sailed away. The solution - to find a friend on line. The conclusion is masterly, making the point with an economy that is more effective than any moralising. Willis and Ross are well known for their partnership, and this is one of their most effective and enjoyable books. The text demands to be read with its jaunty rhymes, rhythm and repetition while the illustrations, show Tony Ross moving away from his familiar spiky caricature cartoon lines to adopt a more lyrical approach. Here colour washes bring a soft glow to each page, seducing the eye. This approach, however, does not in any way diminish the humour or detract from the message; the final spread says it all. 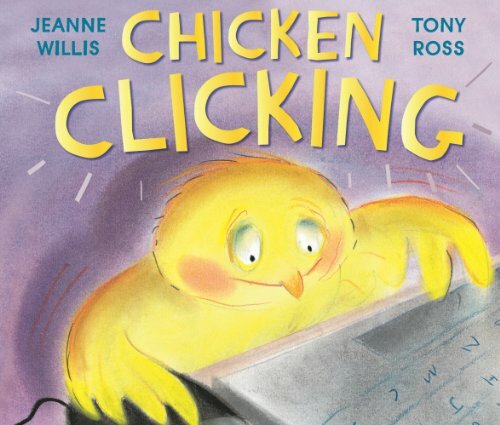 This is an ideal book to introduce the idea of responsible use of the Internet to a wide range of ages, both Early Years and Primary. However, as with all the best cautionary tales it brings its message home with a laugh, delicious suspense - and a real punch at the end. Highly recommended.